One RS232 serial port (TX, RX, RTS, CTS, DTR, DSR). Power: 12VDC nominal (10 ~ 24V). The DS203 is the latest Tibbo Serial Device Server (replacing the Tibbo DS202) - New features include 100BaseT Ethernet port, large routing buffers, additional programming modes, wide supply voltage range and smaller external dimensions. Internally the DS203 is based upon the EM203-EV Ethernet-to-Serial Board (and EM203 Module). Full backward compatibility with the original DS100 Serial Device Server. Network setup can be performed using UDP commands or "Telnet" TCP connection Specialized "on-the-fly" commands for serial port control, "modem" commands to control network connections, status commands for remote status monitoring, etc. The DS203 is a Serial Device Server for external use. Device hardware includes one Auto-MDIX* 10/100BaseT Ethernet port, one RS232 serial port and an internal processor that "glues" network and serial sides together. "Serial-to-Ethernet" firmware, currently in its 3rd generation ("Release3"), turns the DS203 into a ready-to-work serial-to-Ethernet converter that can connect almost any kind of serial device to the Ethernet (TCP/IP) network. This firmware has fixed functionality; you adjust the way the DS203 behaves by specifying the values of programmable parameters (settings) defined in this firmware. • TiOS (Tibbo Operating System) firmware turns the DS203 into a BASIC-programmable controller. When running TiOS, the DS203 has no pre-defined functionality -- it is your BASIC application that defines what the DS203 will do. TiOS and BASIC programming are covered in a separate Manual ("TAIKO Manual"). 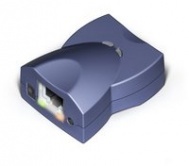 The application firmware of the DS203 can be upgraded through the device's serial port or Ethernet port. Serial upgrades are facilitated by a so-called Monitor- a fixed "service" firmware inside the DS203. Network upgrades rely on the application firmware itself- there is a self upgrade algorithm that will be detailed later. The DS203 is supplied with "serial device server" firmware pre-loaded. If you wish to receive the module with TiOS firmware, please specify option "P" device on your order. Alternatively, you can just load the TiOS firmware by yourself. Current firmware versions are posted on our website. The DS203 uses newer DM9000B Ethernet controller (earlier Tibbo devices utilized an older DM9000A IC). Upgrade to the DM9000B required firmware changes which were made in V3.70 of the "serial-to-Ethernet" firmware and 2.05.10 of the "TiOS" firmware. Earlier firmware versions will not run on this module! If you have to stick to the older firmware, please use the DS203A device instead. * Auto-MDIX means automatic detection of "straight" and "cross" cables.